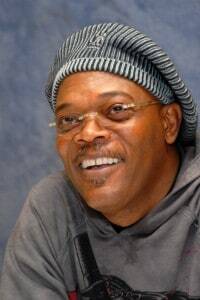 Samuel Leroy Jackson (born December 21, 1948) is an American film and television actor and film producer. After becoming involved with the Civil Rights Movement, he moved on to acting in theater at Morehouse College, and then films. He had several small roles such as in the film Goodfellas before meeting his mentor, Morgan Freeman, and the director Spike Lee. After gaining critical acclaim for his role in Jungle Fever in 1991, he appeared in films such as Patriot Games, Amos & Andrew, True Romance and Jurassic Park. In 1994, he was cast as Jules Winnfield in Pulp Fiction, and his performance received several award nominations and critical acclaim. Jackson has since appeared in over 100 films, including Die Hard with a Vengeance, The 51st State, Jackie Brown, Unbreakable, The Incredibles, Black Snake Moan, Shaft, Snakes on a Plane, Django Unchained, as well as the Star Wars prequel trilogy and small roles in Quentin Tarantino’s Kill Bill Vol. 2 and Inglourious Basterds. He played Nick Fury in Iron Man, Iron Man 2, Thor, Captain America: The First Avenger, and Marvel’s The Avengers, the first five of a nine-film commitment as the character for the Marvel Cinematic Universe franchise. Jackson is set to reprise his role as Fury in the 2014 film, Captain America: The Winter Soldier and the 2015 film, Avengers: Age of Ultron. Jackson’s many roles have made him one of the highest-grossing actors at the box office. Jackson has won multiple awards throughout his career and has been portrayed in various forms of media, including films, television series, and songs. In 1980, Jackson married LaTanya Richardson, with whom he has a daughter, Zoe. In October 2011, Jackson surpassed Frank Welker as the actor with the highest grossing film total of all time. Kelly Gough (actress, RAW): I wouldn’t want to rate them as I respect them all. Daniel Wymbs: I love Samuel L Jackson. Ferdia McAnna (writer): Samuel Jackson is wonderful in everything. Michael Doherty (RTE Guide): The coolest (and busiest) actor in Hollywood. Dominic Mafham (actor): Just is great. Alvean Jones (tv presenter): Brilliant. Film fan: Has wrung every last drop from a characterisation that occasionally borders on schtick. Nonetheless, has wonderful screen presence and a sense of humour that wins over many audiences.